Andrews McMeel Publishing, 9780836267525, 256pp. This book-plus package offers a breathtaking view of the Doonesbury universe in one integrated package. Start with the book: a rich, oversize anthology, jam-packed with America's most provocative and pointed satire -- including 80 Sunday strips in full color. From O.J. and Mr. Butts to Whitewater and Tailgate, from Mike, Kim, and Alex's funky software start-up company to Duke and Earl's Las Vegas long shots, Trudeau tracks the fierce strangeness of end-of-century life through the ever-intertwining fortunes of his substantial cast. 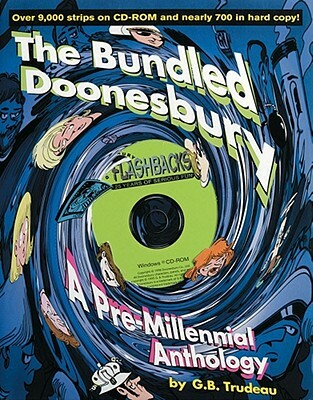 Bundled with this impressive tome is the Doonesbury Flashbacks CD-ROM, a complete account of all things Doonesbury over the course of the strip's first 25 years. The disc contains more than 9,000 strips, archived with every search mode imaginable -- readers can locate strips by character, topic, chronology, dialogue, or location. Contemporary newspaper headlines, articles, quotes, and factoids give useful context for the historically clueless. Other features include a digital bibliography of Doonesbury books, posters, videos, and audio recordings; a Doonesbury trivia game, complete with unctuous host (Mike) and decorative hostess (Boopsie); a Doonesbury timeline; elaborate character bios; and animation. A useful print capability lets users generate crisp refrigerator art from any strip. Thanks to this digital cornucopia you can relive the ages of Aquarius, Reagan, and O.J. through the eyes of G.B. Trudeau and his merry band of misfits.